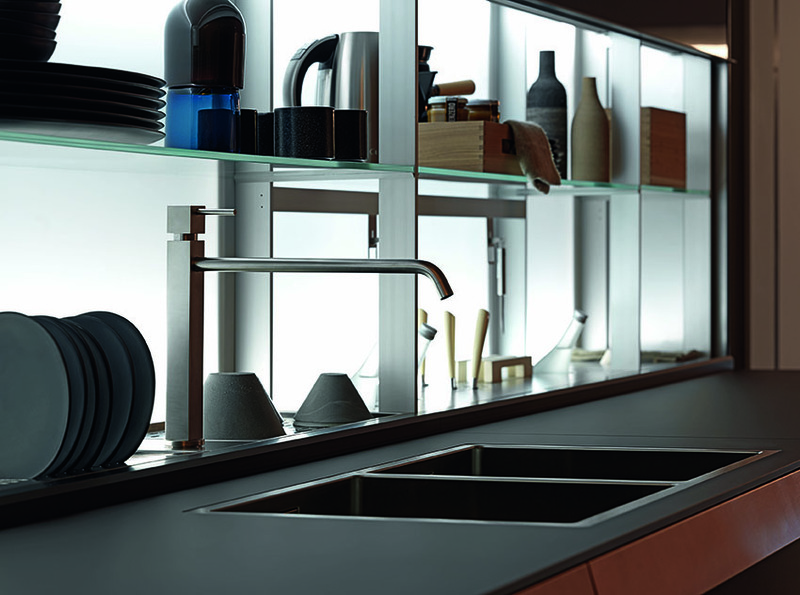 Valcucine's kitchen systems are based on consumer profiles ranging from health nut to gourmet. The Genius Loci line is targeted toward the "innovator," a savvy customer that appreciates technological advances. The systems uses sensors to make it as hands-free as possible: A simple swipe opens the back cabinets or can change the color of the lighting (to one of four hues inspired by the elements), while passing the foot along the baseboard makes drawers open as if by magic. Growing indoor herbs gets easier with Varenna's integrated LED lighting. Special pink-tinted grow lights can be added to any of their systems, including the preview of their new Arthena line, seen here. Scavolini's latest offerings were all about collaboration. They partnered with fashion label Diesel to create the Diesel Open Workshop, a refined take on the industrial look, with open, show-kitchen offerings featuring transparent glass with white netting or smoked glass with black netting and plenty of exaggerated hardware. Nendo brought a minimalist sensibility to Scavolini with Ki, a collection that played off the word's two meanings in Japanese: wood and bowl. The influence could be seen in everything from the simple wood shelves to the sinks and cooktops that echoed the bowl-like shape of the containers seen here. Arclinea's Antonio Citterio–designed booth was all about stainless steel—presented in three finishes created with the PVD (Physical Vapour Deposition) technique: trending black and bronze, plus a luxe champagne gold. The designs were divided between open show kitchens and smaller, closed-off prep areas, like the one seen here.